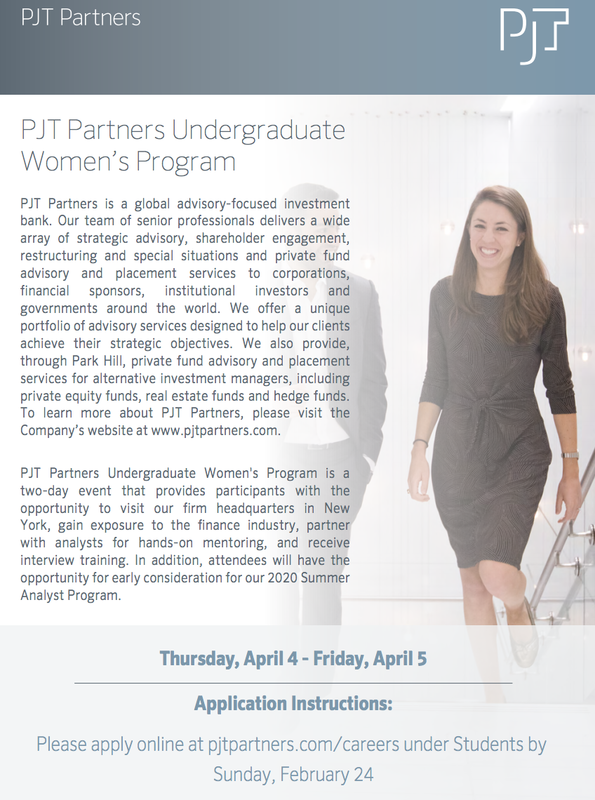 PJT Partners is very excited to host their fourth annual PJT Partners Undergraduate Women’s Program on April 4th - 5th. Attached is a flyer with information on the event as well as application instructions. The two-day event will provide women in their sophomore year with the opportunity to visit their NYC firm headquarters, gain exposure to the finance industry, partner with analysts for hands-on mentoring, and receive interview training. In addition, attendees will be given early consideration for their 2020 Summer Analyst Program. Interested students can submit an application on our PJT careers website here (click Students – application is listed as “2019 PJT Partners Undergraduate Women’s Program”) by Sunday, February 24, 2019.